I have always wanted to make my own toothpaste, but have been really lazy about it. 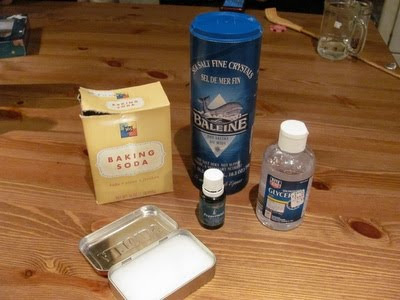 After I made my own deodorant (its the best I've ever used!). I thought I should give toothpaste making a try. I used these instructions I found just googling toothpaste and finding the recipe that made the most sense and was the easiest. They are all just about the same I figured out. There are not many ingredients and the directions are simple. I used peppermint oil to make it taste better and it turns out its almost exactly like my arm and hammer baking soda peppermint toothpaste, except it costs next to nothing to make. 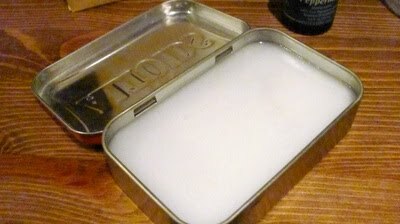 I put it in an altoids tin, and whenever I brush my teeth I just stitck the tooth brush in and grab some paste! One tip I will give you is don't put as much salt in it as the recipe tells you! It makes it almost unbearably salty and your tastebuds freak out (at least mine did). Please try this! I think you will like it. Add enough water to make a thick paste. If desired, a few drops of peppermint oil may be added to improve the taste. Tamara I love these posts! I ran out of deodorant and I am now allowing myself to buy more so I force myself to make it!